Over the weekend I felt like a straight up royal, all dressed up in a 1770s pink silk gown. 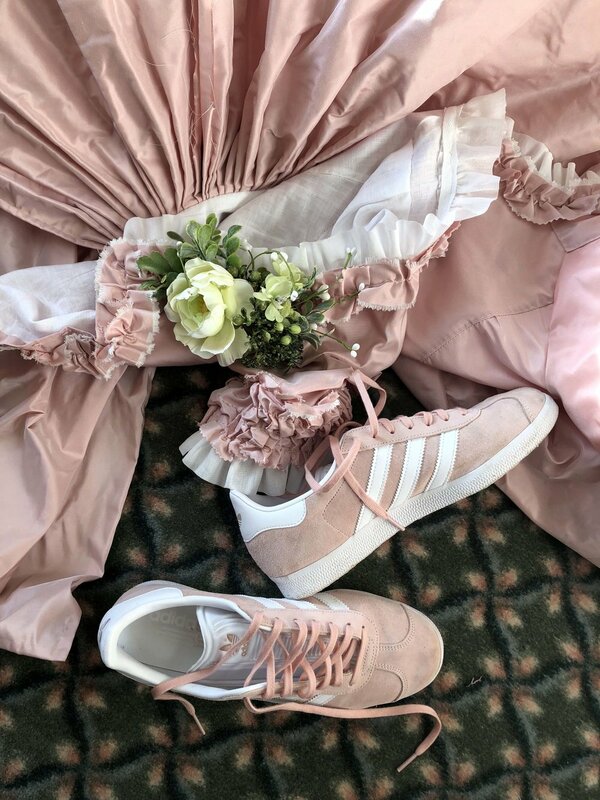 Adam and I drove to Ohio’s oldest hotel, the Golden Lamb, for an intimate dinner party with guests dressed in their best 18th century ensembles. We had such a great time and loved meeting historical fashion enthusiasts! And seeing their gowns and suits close up was a thrill! Many thanks to our gracious hostess Amber, who organized our event! Let me tell you about my look from head to toe! I loved every single step of this project - researching the history, finding inspiration, sewing and especially wearing it. If you’d asked me a year ago if dressing up in Georgian finery would be my favorite hobby… well, I probably would have believed you. I love it! I started getting ready for the night by putting on my sleeveless shift and embroidered stays. These were the only items that went over my head and I wanted to have those on before I started my elaborate hair style. I worked with 3 day dirty hair which had already been powdered a couple times. I divided my hair into a front and back section and to create the height and used a skein of yarn (thanks for the tip Yunna!) and pinned my hair over it and directly behind it. Once I was happy with the coverage and height (covering all of the yarn can be a tad fiddly), I pulled my remaining hair into a low bun. Then, I clipped in a hairpiece that had been previously wet set into five curls. Adam helped me pin those curls over the edges so the base of the hairpiece was invisible. After a vigorous spritz of hairspray, I lightly powdered all of my hair. The photos don’t quite capture the coverage, but it looked awesome! Some might wonder - why was grey/white hair a trend in the 18th century? From my research I believe it first started with the use of wigs by royalty in the 16th and 17th centuries. Many believe it was to cover the baldness brought about by STDs (seriously) and then evolved into a fashion trend. White wigs were the most expensive and thus the look of white hair became most fashionable. Pastels blue, pink and purple powders were also on trend. A tax levied on hair powder at the end of the 18th century helped it fall out of style. I really look forward to expanding my knowledge of historically accurate hair styles but I really loved what I came up with for this occasion! For makeup I simply powdered my face, did a berry colored lip and used the same lipstick to dab onto my cheeks. I did a quick swipe of mascara and was done! 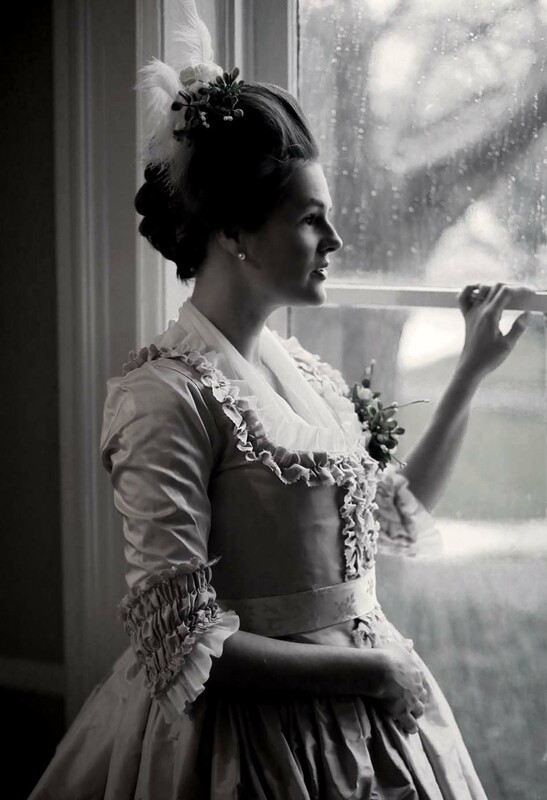 Before I put on my gown, I dressed in additional layers to add more volume under my gown and petticoat. First, a simple white quilted cotton petticoat worn with a false rump stuffed to add more fluff to the back of my dress. Then I tucked my sheer fichu into the top of my stays (which can also be tucked into your petticoat at the waist… but I needed my bodice to lay perfectly flat and didn’t want any of the fichu edges showing underneath!) 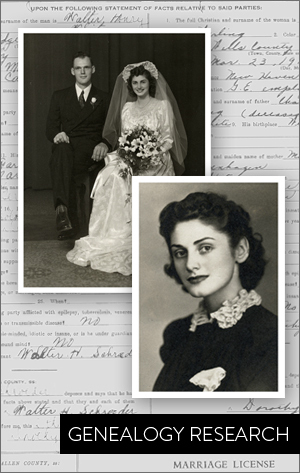 At this time I also had on white stockings and my American Duchess Kensington buckled shoes. Next up - the gown! 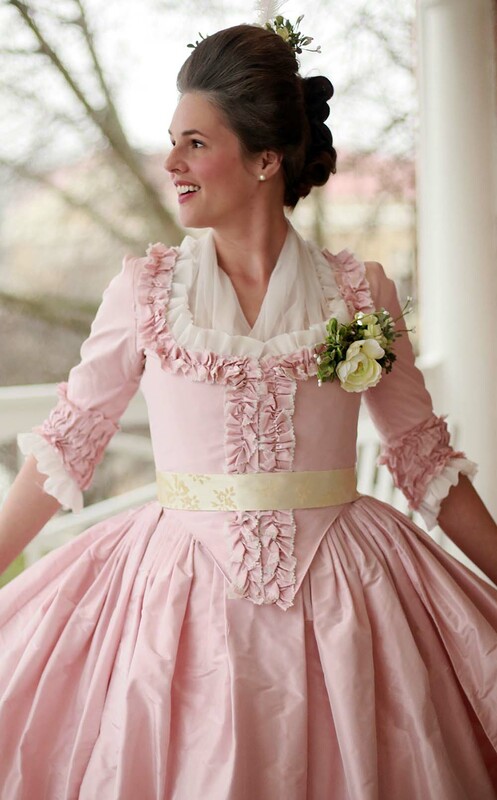 I used six yards of pink silk to make both the petticoat (underskirt) and gown. 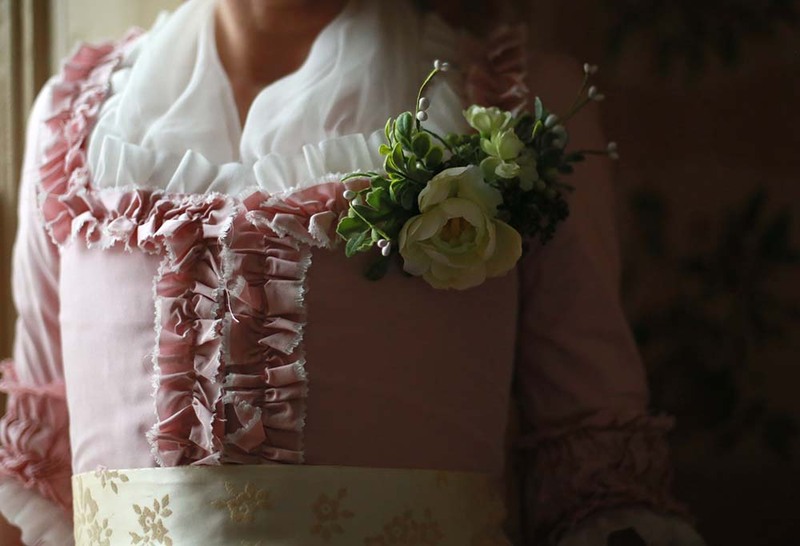 On the petticoat there is a 7” ruffle with scalloped and pinked edges sewn to the hem. The dress has ruched sleeve cuffs and trim around the neckline and center front opening. At the neck and sleeve edges I also placed a narrow sheer ruffle. 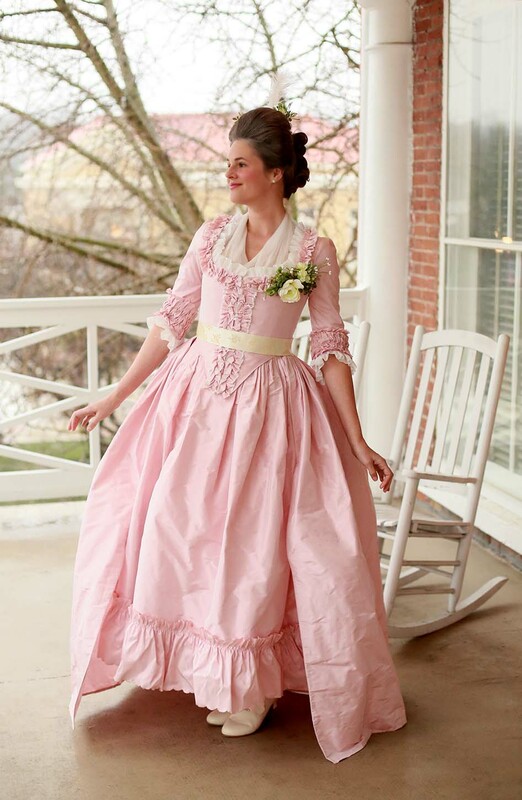 The matching petticoat, also called a ditto, is intentionally short - those Georgians loved to show a little ankle! At my waist I have a 2” wide band of brocade silk, which actually came from my grandmother’s wedding dress (see her wedding photos here). Me, my sister and all of my girl cousins have had a piece of her dress for our weddings (I wrapped mine around my bouquet). I was rushed on what to use and wanted silk so I asked my mom if there was enough of this fabric at home to make a simple belt. She stitched it up for me and handed it off as we headed out the door for our road trip. No, it’s not perfectly 1770s in motif but it looks great, it’s special and perfect to me! Lastly I pinned on a corsage made of springy faux flowers. I’ve seen this in a lot of portraits and illustrations and I love the way it add dimension and color to my overall look. And that’s it! We had such a wonderful time and I’m already on the hunt for a venue closer to home so I might host something similar in the future!